Want Longer Hair? Join Me for the Fall Castor Oil Challenge! The goal of the Challenge is to grow thicker longer healthier hair during the three months. I’ve been consistent with the LOC Method (read about it here) all summer and I have experienced some growth as well as increased overall hair health. Now I want to take it to the next level and sign up for this Challenge. 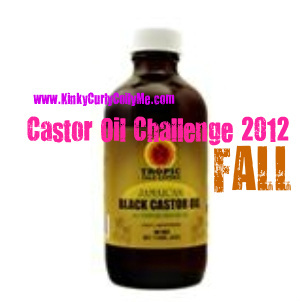 The Fall Castor Oil Challenge will run from September 1, 2012 until December 1, 2012 and the deadline to register is September 7, 2012. There are very specific registration requirements so please read the registration page thoroughly and follow them all. During the Challenge Jenell sends weekly Castor Oil Challenge Newsletters and there are weekly Check Ins. Take a look at the Spring Week 5 Check In to get an idea of what a “Check In” is. Four HUNDRED women registered for the summer Challenge which I think is amazing in and of itself. Healthy natural hair is a process and a journey and I’m super excited to start this next chapter of healthy natural hair. Having a support system and a network to encourage me and share it with is huge. Support is what often separates finishers and quitters. I truly appreciate Jenell for hosting this, the weekly Check Ins make it much more likely that I will complete it. And, as if motivation wasn’t enough, at the conclusion of the Challenge there will be prizes!!! I’ll be using Rite Aid brand castor oil (which can be found in the laxative section…YES, laxative). It’s $6.00 for 6oz. I’m not sure how much I’ll need so I’m going to pick up 2 to tomorrow. You can use any kind of castor oil. Here is the CVS brand and here is some from shop.oilsfromjamaica.com. I’ll keep you all updated on my progress through instagram and twitter so be sure to follow me on both @curlsandmo. Read about some of the benefits of Castor Oil here and join us. Your hair will thank you. 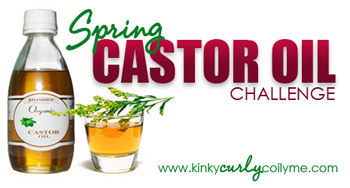 Have you participated in a Castor Oil Challenge before? Do you use Castor Oil regularly? If so, how? Please share below. Update (8/20/12): I bought my Castor Oil from amazon.com, 16 ounces for about $10.00.